Streaming TV is having its pick nowadays. To stay ahead of the pack, OTT providers and broadcasters must not only develop excellent streaming apps but also create cutting-edge app strategies if they want to secure a place in the future. 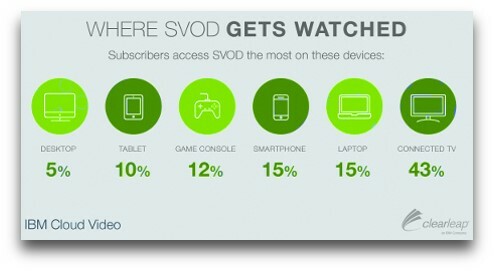 The world of OTT and video entertainment is ever-evolving. New developments take place at an alarming rate and new viewing milestones are reached on a less than annual basis. In fact, according to a recently study, more American television households now have a Netflix subscription than a digital video recorder. That’s huge. What’s even more striking is that people still want the option of TV live for news, sports, or for the sake of old habits. The number of television households has grown in the states for the fourth year running – now sitting at 118.2 million. Last year’s ‘Great Cable TV Exodus’ failed to take hold of the entertainment world, but could 2017 be the year it manifests? As the OTT landscape grows and develops, we feel it might be. The growing preference for OTT and subscription video content is sparking the demand for streaming media devices and Smart TVs. Regardless of viewing evolution, it’s still important to remember that the primary screen will continue to play a dominant role when it comes to content consumption; however, content will increasingly be discovered and played back from devices other than a regular set-top box. The best way to capitalise on this demand is to refine user experience and content inventory on connected devices and make sure to match the quality and consistency of a fully managed experience. Now, the smart television market is on the rise. Why? You might ask. Smart TVs offer certain advantages like update, search, browser, share, download, chat, and other useful functionality to consumers. Smart TVs are equipped with features and an operating system that enables them to run widgets and apps smoothly – and as streaming apps hold at least one of the keys to the future, this big screen device mustn’t be overlooked. Increasingly, mobile streaming apps are attracting TV broadcasters and OTT providers. From the Charleap chart above, we can see the the mobile devices are the preferred “second screen” for watching entertainment. 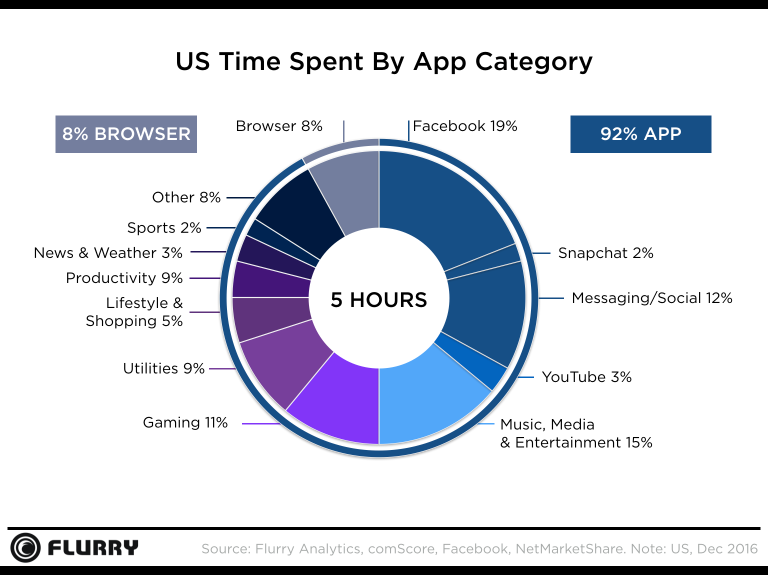 In fact, the average US consumer spends five hours of per day – and most of that time can be attributed to music, media, and entertainment apps, as the Flurry chart shows. With the value of mobile streaming apps now abundantly clear, some of the big guns are now entering the arena. Comcast is launching a brand new TV streaming app boldly called Xfinity Stream, which will replace its older Xfinity TV app on mobile devices. This new development promises to deliver a host of new features to cable subscribers, including access to live TV, on-demand programming, DVR recordings and more. Australian broadcasting giant Telstra has taken the concept one step further by announcing a new dimension of value to its customers. The company recently announced that customers accessing NRL, AFL or Netball games via its apps will be able to do so without incurring any mobile data charges for tuning in. The deal applies to all Telstra mobile customers, regardless of the plan they’re on, including prepaid Telstra plans. Telstra has also launched redesigned mobile apps with additional features. Telstra says it had around 3.8 million users across its AFL and NRL apps last September – a clear indication of the popularity of sports apps. With more innovations and groundbreaking initiatives on the horizon, it looks like streaming apps will play an enormous role in the world of OTT this year, and beyond.